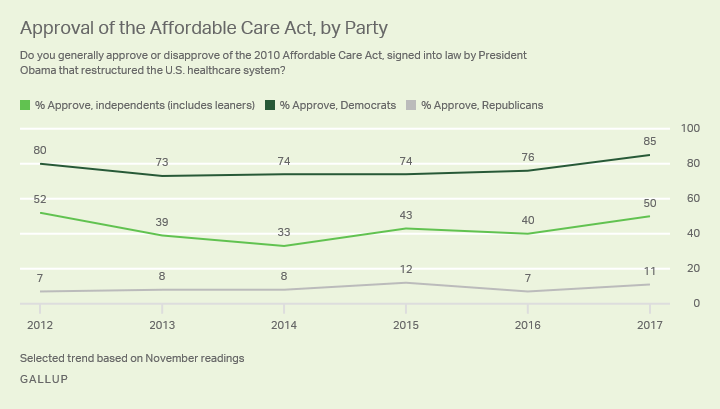 WASHINGTON, D.C. -- After several failed Republican attempts to dismantle the Affordable Care Act (ACA) this year, 50% of Americans now approve of the law, a modest decrease from the record highs of 55% in April and 53% in July. Despite this slight decline, the current approval rating for the law remains higher than all pre-2017 Gallup readings on the question. 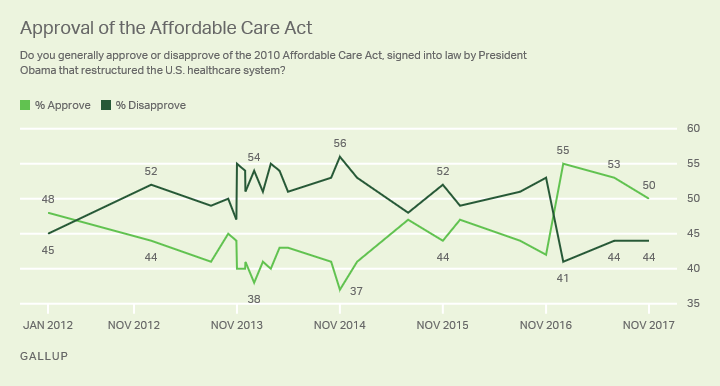 While half of U.S. adults currently approve of the ACA, 44% disapprove in Gallup's annual November Health and Healthcare survey, conducted Nov. 2-8. One year ago, after the 2016 general election, 42% of Americans approved of the law and 53% disapproved. While campaigning, Donald Trump vowed to replace the law if elected, and with a Republican majority in Congress, such a move seemed likely. In April, after House Republicans' first attempt to repeal the law stalled before it could come up for a vote, Americans' opinions shifted to viewing the law positively for the first time. The House succeeded in passing repeal legislation in May, but separate efforts in the Senate failed during the summer months. The issue has come up again as the Senate has included a repeal of the individual mandate provision in the ACA as part of its tax reform bill. 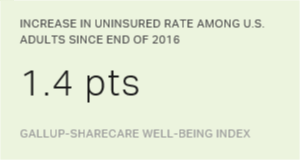 Opinions of the ACA, commonly known as Obamacare, have been sharply polarized since the law passed without a single Republican "yes" vote in 2010. Compared with a year ago, more Democrats and independents now approve of the law, while Republican approval remains low. Currently, more independents approve (50%) than disapprove (43%) of the ACA. When the responses to the two questions are combined, an overall total of 42% of U.S. adults -- a group that includes some who initially approve of it (28%) and some who disapprove (14%) -- want to change the ACA significantly. That is a larger percentage than the 29% who disapprove and want the law repealed and replaced or the 21% who approve and want the law kept as is. The eight-percentage-point increase in approval since last November has resulted in an increased proportion of Americans who approve of the ACA and prefer to keep it in place without any changes. At the same time, as disapproval fell overall, so too did the percentage of those who disapprove and want the law repealed and replaced. Democrats who approve of the ACA are more likely this year (41%) than they were last year (26%) to say they favor keeping the law as is. Likewise, though not to the same degree, independents who now approve of the law are more likely than last year to favor keeping the law as is. For their part, Republicans' views are little changed from one year ago -- almost nine in 10 disapprove of the ACA, and about seven in 10 prefer that it be repealed and replaced. Multiple failed efforts by congressional Republicans to repeal and replace the ACA have done nothing to soften rank-and-file Republicans' desire to undo the law. Democrats and independents, however, have become more positive in their appraisals of the healthcare law. The president has attempted to chip away at the law through executive orders, and Republicans in Congress may address healthcare reform in their proposed tax legislation. The healthcare law has been a major issue in every national election since it was first passed in 2010, and it may well continue to be in the 2018 midterms.